The work is just incredible.. For as long as I can remember, my creative gears have always been spinning. When I began working with metal, my imagination ignited and those creative gears began to spin rapidly. 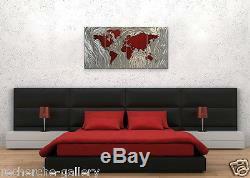 Metal Wall Sculpture by Ash Carl Modern Home Decor Map Metal Art. 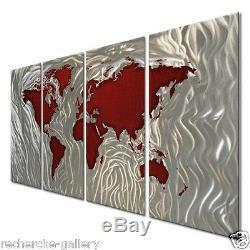 Bring a captivating look to your home or office with this four panel contemporary metal wall sculpture by Ash Carl. 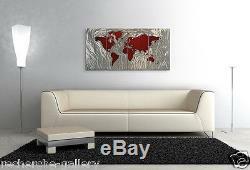 The wall hanging features an engaging painting of a world map. Each panel has a hand-sanded design around the worlds continents that creates a unique three-dimensional effect. As you pass by, the artwork seemingly moves by reflecting any light in the room. Lighting brings out amazing movement and texture in each panel! The hand carved reflections can only show their best qualities in person. 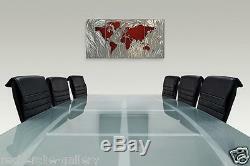 Size: 51" W x 23.5" T x 1" D (Width includes recommended 1" spacing between panels) 4 Panel Set. High Quality Durable Welded and Bolted Construction. Every order is inspected and packaged with high quality packaging materials to ensure your order is delivered safely and securely to any location worldwide. All of our packaging is recycled and recyclable materials. Beyond my expectations and I'm a critical artist myself! Easy to hang, even a caveman can do it!!! Ash Carl first began working with metal in 2006 at a metal fabrication shop. His creative mind ignited while working on an assembly line sanding, welding, cutting, and painting metal. It didn't take long before his newly learned knowledge of metal and artistic sense fused together and he began designing and creating an array of metal art in his 600 square foot garage. As word spread of his unique creative abilities, his artwork became increasingly popular and soon galleries began contacting him asking for a chance to display his remarkable work. Many businesses, interior designers, contractors, and architects began requesting commissioned and contracted work. In 2008, Ash Carl began working out of his 5200 square foot studio to meet the high demand of his metal art designs. His artwork became much more complex in detail and character as he began using all metal: aluminum, steel, stainless, brass, and copper to create a more diverse assortment of work. He has near perfected the holographic illusions that are created from the different hand sanded finishes on metal. His artwork became much more three dimensional with recent developments in the reflective qualities of his work. The different finishing, painting, and forming techniques that are signature to Ash's work can be seen worldwide as his international collectors are in over 35 different countries. Ash Carl's exclusive metal art features an array of details. His signature hand sanded finishes create unique three dimensional effects from reflected light. While many have tried to mimic his abilities, all of have come short of his artistic originality. Tens of thousands of people have experienced Ash's artwork which is featured in galleries across the globe, high end restaurants, hotels, office buildings, and many homes. Today Ash is actively working on his own art creations and has collaborated with numerous artists to incorporate their painted creations with hand sanded metal artistry. This vision of putting together this combination offers an unparalleled collection of metal wall art creations to an array of art lovers all over the world. Megan Duncanson, Ruth Palmer, Michael Lang, Justin Strom, and many other artists have joined together with Ash Carl to bring their art to the very popular metal medium. As Ash Carl's art is becoming increasingly in demand, he will constantly push to bring more of his creative artworks to life while partnering with various artists to bring a multitude of different mediums, styles, shapes, colors, and sizes to all types of art enthusiasts. The high quality of his artwork will continue on through many generations to come. Recherche Gallery is open Monday - Friday from 8:00 a. Please allow up to 24 hours to respond to your questions. All emails received during the weekend will be responded to on the following Monday. The pictures shown are for general reference and the item you receive may differ slightly from the pictures in the listing. We cannot guarantee that the color you see on your screen is the color of the artwork. All computer screens show different colors from each other, which may not be the accurate color of the artwork. Many pictures are taken with track lighting to show the distinct sanded patterns. Track lighting may create a gold appearance on artworks that is solid silver. Track light will also make the colors of the artwork appear lighter and the amount of direct light on most pieces will change the color. Images with sofas or other objects may not be to scale and are for representational purposes only. 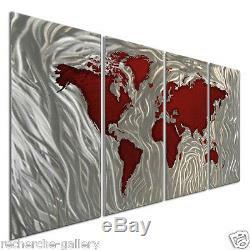 The item "Metal Wall Sculpture by Ash Carl Modern Home Decor Map Metal Art" is in sale since Friday, December 18, 2015. This item is in the category "Home & Garden\Home Décor\Wall Sculptures". 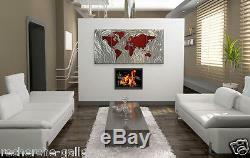 The seller is "recherche-gallery" and is located in 56474. This item can be shipped to United States.